Flying high above the snow-capped Alps towards the north-east coast of Italy is a breathtaking experience that leaves one contemplating the vastness and timelessness of such things. I was on my way to SCM, a company that has grown and developed over the last 50 years to be the second largest manufacturer of woodworking machines in the world - a fairly vast thing in its own way. The Adriatic coast and the surrounding area of Rimini, Villa Verucchio and Pesaro is the heartland of the company and is a mixture of heavy industry situated on flat plains, punctuated by towns and villages that are a quintessential mix of Italian modernism and historical architecture dating back to Roman times. Surrounded by the sea on one side and olive groves, vineyards, high hills and steep slopes on the other, it has a healthy Italian tourist trade. SCM is mostly situated in Rimini - I say mostly because along the coast road you could be forgiven for thinking that the company also owned the road as there are so many of its factories along it. F&C readers probably know the company and if they are not aware of its huge range will no doubt be familiar with its brand of MiniMax machines. In Britain, many of the workshops I have visited have a core of SCM machinery at their heart, and when I visited Cyprus a year ago every workshop had the group's equipment in one form or another. Perhaps a few readers have seen SCM's enormous stands at Woodmex - don't forget there is a show this year, scheduled for 8-11 October at Birmingham NEC. The group makes everything from 12in planer/thicknessers for the small maker or committed home-user, to multi-headed CNC machines for panel production, and they can design and build a whole factory line. 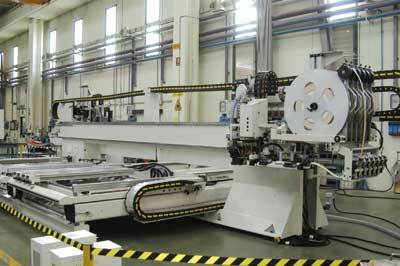 The various parts of the SCM GROUP make each specialist type of machine. At the last count it was 20 factories and still growing. This kind of expansion does not happen overnight of course, and 2002 saw its 50th anniversary. In that time they have installed two million machines in over 120 countries. 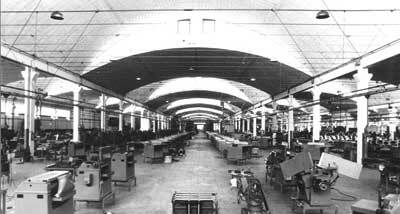 SCM (Societa Costruzione Macchine) originally started in 1932 by Nicola Gemmani and Lanfranco Aureli making agricultural machinery. These same two families are still running the company today. 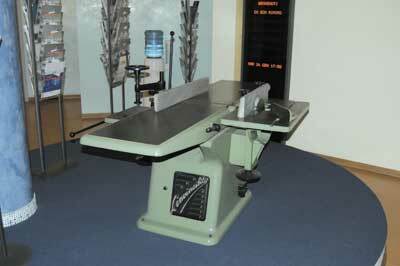 The year 1952 saw the launch of the first woodworking classical machines under the brand name, L'Invincible. 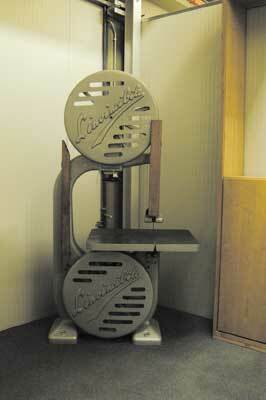 These were extremely solid cast-iron affairs drawing heavily on the company's foundries set up in 1938. 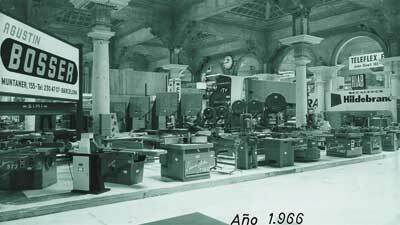 Two examples still exist in a number of the company's foyers; a bandsaw in the Rimini foundry and an original multi-functional machine, a surface planer with a small circular saw driven off the cutter block, sits in the foyer of the Rimini HQ. I'm sure some of F&C's readers would be happy to use these even today. 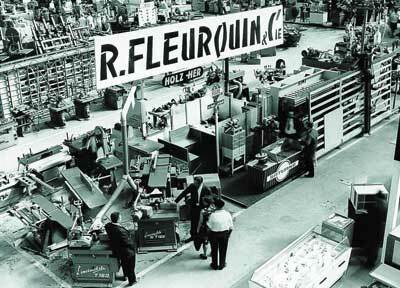 From those early days, the company expanded its range to suit the woodworking world's demands for ever-varied machinery, backing this up with a commitment to a personal service. 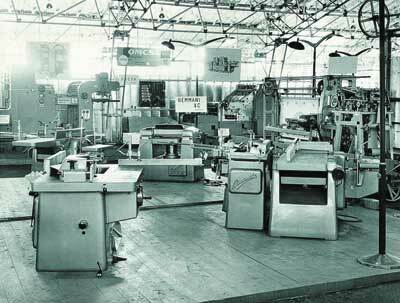 It was solid-wood machining that the company concentrated on until 1987 when the group bought its first panel-processing company Morbidelli. From then on the company continued to expand, buying specialist premier companies that increased the range it could offer. These were Gabbiani for panel-sizing saws, DMC for large-scale sanding, Routech for CNC machining centres, IDM and Stefani for edgebanders and squaring, CMS for CNC solid profile machinery, and Mahros, a company specialising in material handling. As well as all this there are 23 worldwide subsidiaries that offer sales, service back-up and training. Today the group employs 3,000 people in 20 factories and has an annual turnover of ï¿½500million, and produces around 30,000 machines per year. Because the group is so diverse and very much involved in the high-tech end of the woodworking industry, it would be easy to think that good old classical machines, that for many smaller makers are the basis of their business, could get left behind. However, on testing some of the machines myself in both its MiniMax and SCM ranges, and seeing some of the new developments planned for each, it is obvious to me that the group sees the small maker as being a very important element of its overall strategy. This is particularly relevant to F&C readers in the MiniMax series, which are constantly improving. The core of the SCM group today is still solid wood processing, from solid classical machinery to whole window and door lines. Beyond this though, with the development of the panel-machining specialist companies means that the group can offer a complete package, pulling all of the different elements and specialities of the group together. Indeed there is a section of the company that specialises in designing and setting up complete production lines to suit a client's needs. Because SCM has this ability it can offer the service all over the world. 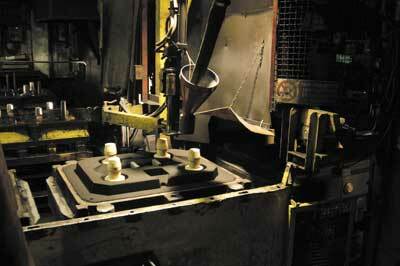 One of the reasons for the group's success is the amount of control it has over the manufacturing process. There are components that are brought in, such as electric motors as no modern company could make everything in-house. 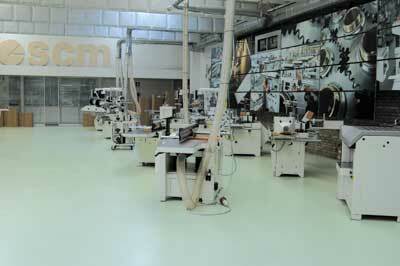 However, a huge amount of its production is in-house. 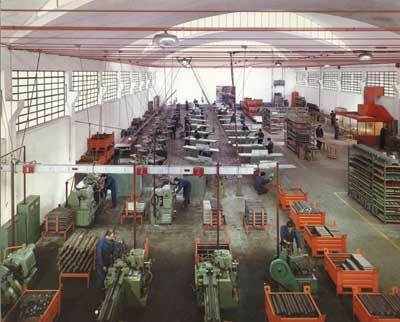 The group is probably unique as a woodworking machinery manufacturer to cast all its own tables and components in its own foundry, in fact they have two, one of which is the third largest in Europe. Running a foundry is an expensive business, so both specialise in different aspects of casting, one in small components and the other in large work. 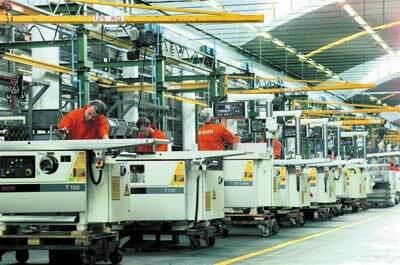 Only a little over 10% of the work is for SCM, the rest for companies such as Ford, Whirlpool and Ferrari. From casting there is also a fabricating company, Steelmec, which produces the majority of the casework for the various factories. Another part of the group, ES, specifically builds many of the electronic, electromechanical components required by such complex machines. All of this gives the group flexibility across the whole range of its products where there are components that are generic, meaning new products can be designed reasonably quickly. A recent example of this is an ongoing project with Apreamare who build Gozzo Sorrento boats. This involves developing a 4,000sq m woodworking department in a huge brand-new boat-building yard, capable of constructing 20m-long boats. SCM engineering has designed a whole production facility for the machinists to the fitters, involving everything from MiniMax and SCM traditional machines to Morbidelli multi-headed routers and borers. This huge project will be completed in 2007. Another is an even bigger project, designing a whole production line for a British company in China. "The core of the SCM group today is still solid wood processing"
Research and keeping up-to-date with the latest industrial technology is critically important and very much part of the SCM ethos. It invests 5% of its turnover each year into this and has unique facilities for vibration and decibel level research at its Consortium for Study and Research (CSR). In the same way that the foundries work with other companies, CSR is very often working with both international research bodies and major industrial companies. The group continues to grow and develop in new areas and has bought two new companies involved in stone and glass cutting technology. CMS Brembana and CMS Technometal.